The brief was to increase the footprint of the estate by developing a contemporary family home that would sympathetically sit side-by-side with the existing manor house and buildings. The regeneration project at Parlington was designed to celebrate everything an English country house should encompass while adding revolutionary design elements to a new property that fit perfectly alongside the landscape in which the estate sits. Size and scale were paramount in the development, of this practical yet revolutionary PPS7 home on this prestigious estate. While ground-breaking design and sustainability were central, equally important was enhancing the existing area and making the most out of the development. The approach to the building needed to be striking and practical. The new building had to work independently and also hold its own within the context of the estate as a whole. As well as adding new design features to the development, the team incorporated estate - wide restoration work which they felt would boost the site. Historically Parlington Hall was linked to the walled garden, an element Sadler Brown felt should be restored alongside the introduction of a traditional enclosed garden, improving accessibility and visual link to the Triumphal Arch. The approach is inspired by the concept of historic layers, from this a new framework of spaces, structure and horticulture was introduced. Using the history of the house and land helped develop the new setting and respect for the heritage of the estate was key to all elements of design and regeneration. 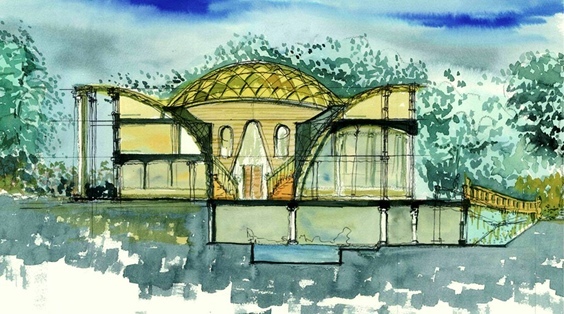 Environmental sustainability was central to creating a functional and environmentally friendly modern home â power generation, water collection and waste management were considered from the outset to ensure any additions respect the rural environment in which the home was set and didn't interfere with the elegance of the building. Before I set about my critique of what I found I should first say that my thoughts are just that, my thoughts , others may have a different opinion of the scheme. Also like any content on the Internet copyright applies, so I am using the images by way of the creative commons license, found on many sites. I fully acknowledge the ownership of the originals as set out on their web site here: http://www.pps7.co.uk/inspire/12/pps7-house-yorkshire [ Note 2014] It seems the project pages along with the whole website have disappeared. For what its worth I think the sketches are attractive, but I am concerned with practicalities, building use, and where development comes into contact with existing buildings, especially listed ones, how the overall development works. Hmm! Fortunately it has not been built, and I say this because, and I am no Luddite, in my view it does not do justice to the site, and it most certainly puts a finger up to the earlier edifice that had stood the Gascoigne family in good stead through the Civil War and the persecution of Papists, to name but a few. It was the hub of local life, not least through the industry associated with the area, and finally it was the home to a creative and determined Anglophile family, whose heritage should leave us in no doubt as to the worthiness of our forebears. Lets look at what was proposed, firstly on the opening line, "The brief was to increase the footprint of the estate by developing a contemporary family home..." OK, lets break out from the buzz words of modernity, how do you increase the footprint of the estate? The footprint is just that, no more no less, or do they mean by changing the characteristics of the footprint... as in making it "more famous", "higher profile", or "more important"; well that's not clear, however it continues... "that would sympathetically sit side-by-side with the existing manor house and buildings." Well, as you will read and see later it does not sit at all with the existing manor house, it replaces what remains of the mansion house, not manor house, and perhaps dominates, putting it mildly, the landscape in respect of the adjoining Georgian, listed, Gardens House. Moving on... The regeneration project at Parlington was designed to celebrate everything an English country house should encompass I'm not sure what this means, again it is a statement not dissimilar to the earlier opening point, that seeks to provide a comfort to the reader whilst having no substance. Clearly a country house encompasses nothing more or less than family accommodation in the country, it may have x or y to suite the occupants but these are not things it should encompass , merely things it might encompass, and these things are not for others to give ascendency to in regard to should , how fatuous! However it gets worse. while adding revolutionary design elements to a new property that fit perfectly alongside the landscape in which the estate sits. Revolutionary design elements, in architectural speak means, Hey we would really like to try out this new idea, we don't have the remotest notion of its durability, acceptability or cost! Remember the 1960's. At this juncture I need to bring in the first of the designs to properly examine, the statements I am considering. The picture above is an architectural concept drawing of the proposition, can we really consider this to... "fit perfectly alongside the landscape in which the estate sits." The commentary continues, Size and scale were paramount in the development, of this practical yet revolutionary PPS7 home on this prestigious estate. Well here again I take exception, the "size and scale", if paramount, must take into consideration the scale of the existing Gardens House, I contend that a four storey structure, with a domed roof, and exaggerated colonnades or pseudo "Porte Cochère", does not sit comfortably with the much smaller and significantly lower height, two storey Georgian House, I suspect that the height or datum of the roof of the proposed building is greater despite its elevation at ground level being approximately 8 or 10 feet, lower than the older Gardens House as the whole area slopes to the south. Further, While ground-breaking design and sustainability were central, equally important was enhancing the existing area and making the most out of the development. The notion of a ground-breaking design, leaves me troubled as there is little or no evidence of anything so exceptional, to suggest that a broadly circular structure, with attached colonnades is ground-breaking is pure rhetoric. Sadly we then find the next buzz word of our contemporaneous times, sustainability . [Def: Sustainable = Able to be maintained at a certain rate or level] So almost anything meets that criteria, my view of sustainable, if the intention is something which can be reasonably used without undue pressure on the environment, it would be something knocked up by Ray Mears! The volume of concrete, timber, glass, steel, and other building materials in the proposed project is, and always will be heavy on carbon usage, you can't get away from it no matter how you frame the description; it is a lie to pretend otherwise. Well they've had their "green moment", by addressing the so called sustainability. The last piece of the sentence equally important was enhancing the existing area and making the most out of the development. Well of course anybody would seek to make the most out of the development, call me cynical, but this means money, as much as is attainable! That 's always the way it is, but lets not make this a feature. On to the next sentence, The approach to the building needed to be striking and practical. The new building had to work independently and also hold its own within the context of the estate as a whole. Well, more wordiness, hold its own , give me a break! Sadly it does not improve as the text continues, As well as adding new design features to the development, the team incorporated estate - wide restoration work which they felt would boost the site. Historically Parlington Hall was linked to the walled garden, an element Sadler Brown felt should be restored alongside the introduction of a traditional enclosed garden, improving accessibility and visual link to the Triumphal Arch. To best appreciate these comments, it will be beneficial to view the remaining drawings, the first, shown in the head of the page, but repeated to reduce scrolling, utilises the 1908 OS Map to establish the site layout. The next is the ground floor plan and finally a section. Referring to the site layout, and with regard to the statement considering the walled garden as an element worthy of restoration, it continues, alongside the introduction of a traditional enclosed garden , surely it is obvious that restoration of the walled garden is explicit as it forms part of the Grade II listed property and in fact was, when in proper use, a fully working traditional enclosed garden! 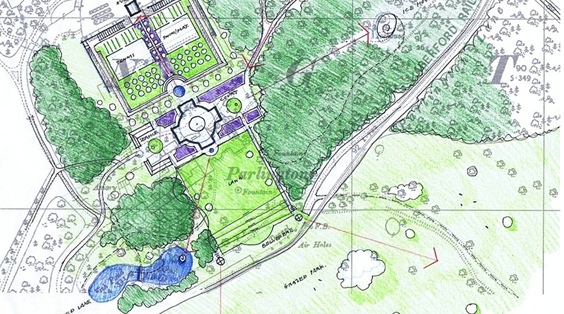 The plan shows key elements from the new house by way of arrows, indicating the visual links they describe, in particular reference to a view of the Triumphal Arch, which is quite impossible from the location chosen for the house. The property is aligned along the axis which flows from the way the Gardens House was originally built and uses as a baseline the link which formerly existed through the centre of the walled garden past the sundial (see 1930's photograph at the foot of this article). To the north of the house is a proposed circular water feature, but also to the south is a smaller circular water feature, these enable the ground floor plan to be visualised correctly orientated, the ground floor plan in relation to the site layout should be imagined rotated around 135° anti-clockwise. Then the location of the entrance, shown with a car inside the Porte Cochère, makes sense, as access is on the east side. One of the features of the Old Hall and also the Gardens House is they are both directly aligned to the summer solstice! Therefore for the proposed scheme to adopt this orientation makes sense, but I suspect it is a coincidence, simply following the earlier layout, Iâm sure if they new this it would have featured in the description, making them appear even more green! Looking now at the ground plan, I'm not sure what to say, but I feel I know what both Sir Thomas Gascoigne and his father Sir Edward would have observed; there is barely a straight line in the place, aside from the columns at the four vertices every other element is formed on a curve, rooms are even kidney shaped, all a monumental expense, clearly drawn on a whim! One thing we know of the Gascoigne family they were not inclined to waste, hence I imagine the design would find no approval with the two of them. The fact is that on plan it is easy to draw, but in three dimensions the angles at the junctions, particularly between the ceilings and walls can be most awkward. Further every material used is likely to be subject to considerable wastage, it is no coincidence that rectangles are the order of the day for most layouts. 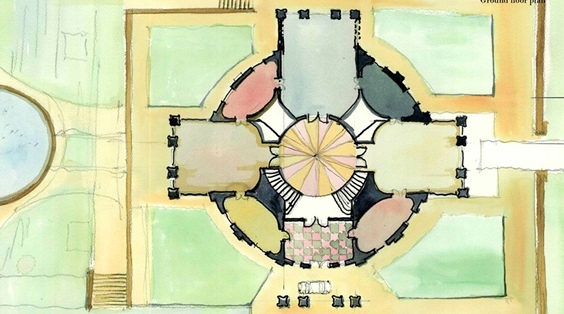 Finally, with regard to the plan, as I do not wish to take too much time on this analysis, the area is considerable, rivalling the extent of the Old Hall, yet the rooms appear to be only seven, plus the entrance lobby and central atrium, therefore the three key spaces, the ones fronted by the columns are huge, each being roughly the size of the original Drawing Room at Parlington, how such spaces would be used in a "sustainable" way is over my head! Finally, the section shows a grand central atrium topped off with a geodesic space frame, along with the intersections from the out facing colonnades, yet again with more curves, but this time vertical, how these would fit with the horizontal curves is an engineers nightmare! But to conclude, the ground elevations are all over the place, the layout plan shows a lawned area to the south, which is the lowest part of the site, but the isometric view and the section bear no relation to this landscape! So no need to say any more, although there are many other points which could be made, totally impractical, and to paraphrase HRH Prince of Wales, a Monstrous Carbuncle! Send me your observations about this scheme Below are some of the comments received so far! I totally agree. Considering the Estate has done nothing to promote or preserve the historical properties of Parlington I can't understand why money is not put towards restoring and repairing the now delapidated Gardens house. Why built new when old, architectually beautiful buidlings decay? 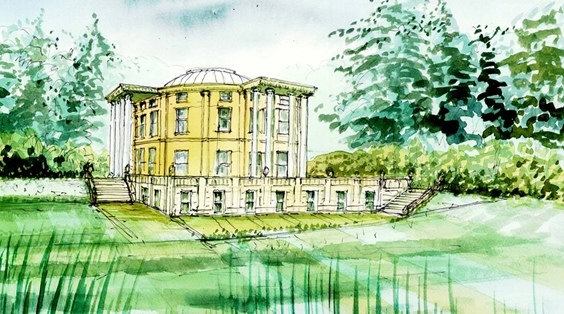 If someone could produce a really good, well thought-out scheme for a new country house on the site, that could be the answer for the future for the estate. Far better than hotels and golf-courses, anyway. But, as you say, this is not it. wow! stunning proposal indeed!! I hope this is well and truly an historical proposal. I'm all for exciting, innovative and contemporary design and this is none of these things!!! I cant recall ever seeing anything being passed by the parish council regarding redevelopment on the Hall site so I guess this was consigned to the dustbin shortly after having been paid for! Still, a good find and worthy of a page on the website for sure and might be worth somehow making reference in the VDS to redevelopment of historic outlying buildings that are 'in keeping' 'sympathetic' and 'to scale', amongst other things.. I totally agree with you, Brian, your 'Oddness' section could in this instance be more fitting perhaps as a 'Hideous' section. 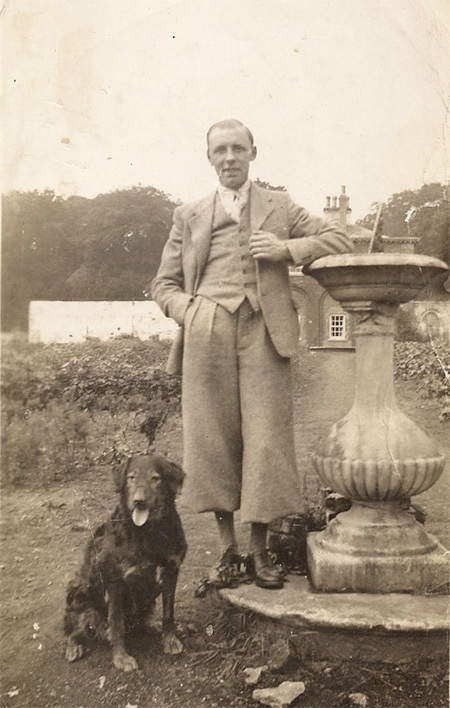 The photograph kindly contributed by Susan Shillito, is of her father Cyril Ward, who married Beatrice, the daughter of Fred and Elizabeth Selby. The Selby's lived for a number of years at the Gardens House. The quirkiness of this prospective development places it squarely in the Oddness Section, where I believe it belongs. Hopefully in will never come to fruition.